Space is limited – make sure you reserve your spot for the IoT in Action event in Houston! Register for free today! As computing becomes more deeply embedded in the real world, powerful new opportunities arise to transform revenue, customer experiences, safety and productivity – to name a few. We’re also seeing intelligent cloud and intelligent edge solutions spark massive transformation throughout various industries. 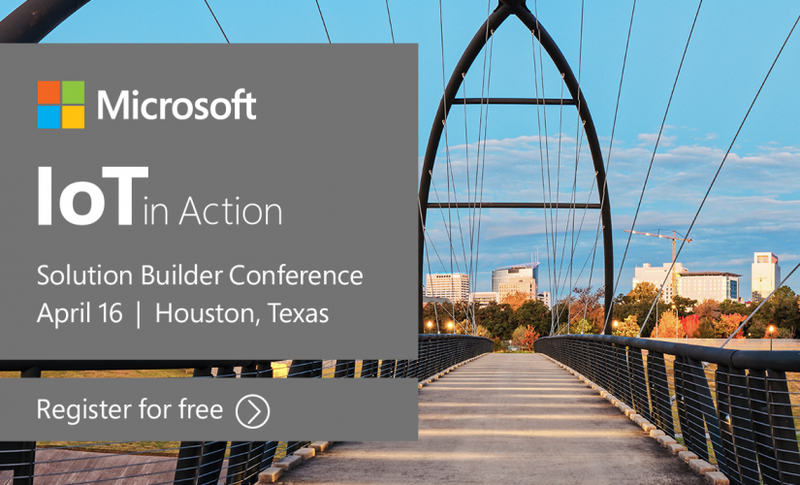 Join IoT experts, Microsoft partners and customers at the upcoming IoT in Action event in Houston to hear real-world examples of how the cloud is transforming city government, industrial IoT, and oil and gas innovators. Read on for insight into what a typical cloud transformation journey looks like within the context of the Internet of Things (IoT), as well as applied to specific industries. Industrial IoT organizations are on of the most common to embark on a digital and cloud transformation journey. For instance, manufacturers find they are able to streamline operations, increase productivity and predict issues before they occur when they combine cloud with IoT. One such manufacturer that has used cloud transformation to create a valuable service is Rolls-Royce. With more than 13,000 commercial aircraft engines in service worldwide, Rolls Royce uses data from equipment sensors to help airlines predict and plan for maintenance needs and increase fuel economy. This helps its customers minimize costly delays and maximize fuel efficiency. The solution is powered by the Microsoft Azure platform and Azure IoT solution accelerators, using them to help filter, synthesize and analyze massive volumes of data. This allows the company to deliver actionable insights to the proper stakeholders at the best time. The City of Houston is on a mission to connect its citizens to the city and the city to its citizens. In the wake of massive Hurricane Harvey destruction, Houston mayor Sylvestor Turner wants to do more than just rebuild: he wants to make the city safer, more resilient and more connected. When you think about firefighting drones, smart water meters, transit wi-fi and flood detection sensors – the one thing they all have in common is that they’re cloud connected. To that end, the City of Houston is working with Microsoft and Microsoft partners to leverage cloud transformation to take care of its citizens. This includes building repeatable IoT solutions that span public safety, connected neighborhoods, disaster recovery and response, transportation, smart buildings and more. Shared vision and strong collaboration from city leaders have been crucial to the success of this massive undertaking. So how do different companies and industries go about embarking on a cloud transformation journey? I’ve outlined some typical steps based on my own observations and research done by 451 Research. Make Innovation a Priority: The first part of any transformation journey is building a culture and mindset that is willing to innovate, that welcomes change and the potential it brings. If leadership does not set the example of an innovation mindset and make it a priority, it will be difficult to achieve buy in internally. Understand the Why: Typically, there are many reasons for moving to cloud: increased cost savings, greater availability, better performance. Knowing why you want to make the transition from a strategic standpoint and aligning with your overall business goals can help focus efforts and find the right cloud fit. Prioritize Applications: Determining which applications most need to be modernized and migrated is key. Migration is an opportunity for modernization of the IT ecosystem, which can ultimately save time and money. Making a prioritized plan and budgeting for modernization needs is critical. Expect Increased Usage & Costs: Cloud consumption typically increases after initial migration. Due to easy access and relative low-cost, developers and administrators will consume more resources, developing new applications and solutions. Resource sprawl is also a likely outcome as stakeholders jump on board the cloud bandwagon. Know It Will Even Out: Once an organization obtains a better understanding around actual cloud consumption, it will be able to prioritize workloads, bring some workloads back on premise, and negotiate pricing models. Implementing governance processes will help to control costs and ensure optimal performance. As you look for ways to leverage the power of intelligent cloud and intelligent edge IoT solutions, make sure to join us for the one-day IoT in Action event in Houston (April 16). It poses a unique opportunity to explore innovative, scalable IoT solutions that enable cloud transformation across industries, connect with experts and explore new opportunities with Microsoft partners and customers.